Achari curry is made with all the spices of pickle or achar/pickle. Achari chicken is a delicious dish which goes very well with roti, parathas or naan. Some of us like achari chicken with lots of spice and stuffed chilli. But personally I like this way. Some of us can easy to easy to add oil from achar (Pickle). If you want more spice, use these spices (mustard, fennel, nigella, and fenugreek) 1 and half times more. If you want little bit sour, use lemon juice. 1. First roast all seeds (cumin, fennel, nigella and fenugreek) separately about 30-45 seconds and grind it coarsely. 2. Heat pan with oil and add onion till onion becomes soft. 3. Add chicken and cook chicken to seal it. 4. Add garlic, ginger, onion paste, turmeric, chilli powder, mustard paste, mixes spices and salt one by one. Cook it till oil comes out. 5. Beat the yogurt and add it to the curry. 6. Cook it about 15 minutes in closed lid. Stir it occasionally and if it gets dry and add 1-2 tablespoons water. Add green chillies. 7. Check the salt and 1 more minute. Achari chicken is ready to serve. 8. 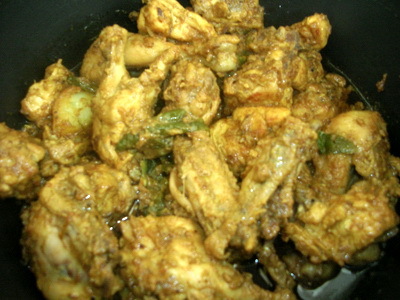 Serve hot achari chicken with roti or parathas or rice. Tips: you can use half mustard oil and half vegetable oil. This looks delicious! I’ve never had achari curry, but it sounds amazing, especially with some naan! It goes well with naan.. try it and let me know your experience. Thanks. This recipe is very unique. I like the idea of putting pickle on meats. I must confess my mind set to Bangladeshi Foods changed once I saw you recipe site. Go Ahead Bangladesh. Thanks. Your word means lot to me. Hope you will try some of our recipes and share your experience. Loved the achari recipe look forward to more of the same quality! I just found your website and I am excited to try your recipes. I have one question.. I do not recognize some of the spices, and in the USA they are not easy to find in regular stores. So could you please let me know the Bangla names for them so that I can look in desi restaurants? I have no idea what nigella, fenugreek, fennel are..
Hi!Nigella is kalijeera, fenugreek is methi and fennel is mouri. You should get all this spices in Indian or Bangladeshi grocery. Otherwise you can use pachforon. Thanks. If I use panch phoron instead of the separate spices (nigella, fenugreek, fennel, cumin), what amount should I use? 2 teaspoons? yeah 2 teaspoons maximum. Thanks. First of all a big thanks to u for your all yammy recipes..!! Can u plz post your all recipes in Bangla also..? ?